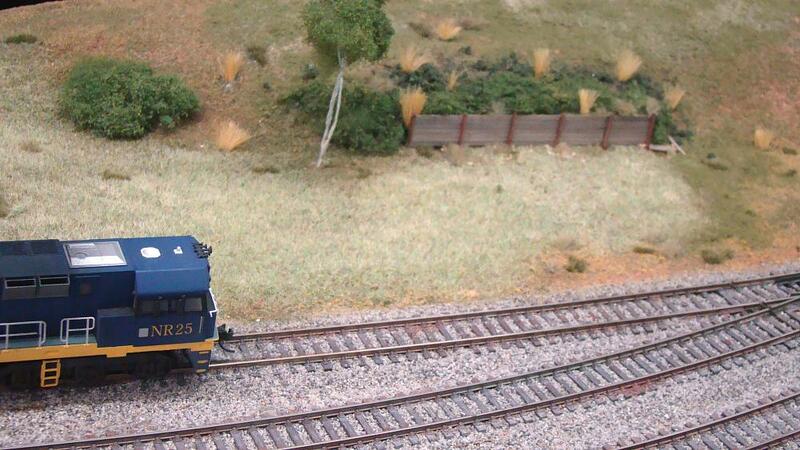 With the major work of lengthening the storage yard out of the way, our focus returned to adding detail to the layout. 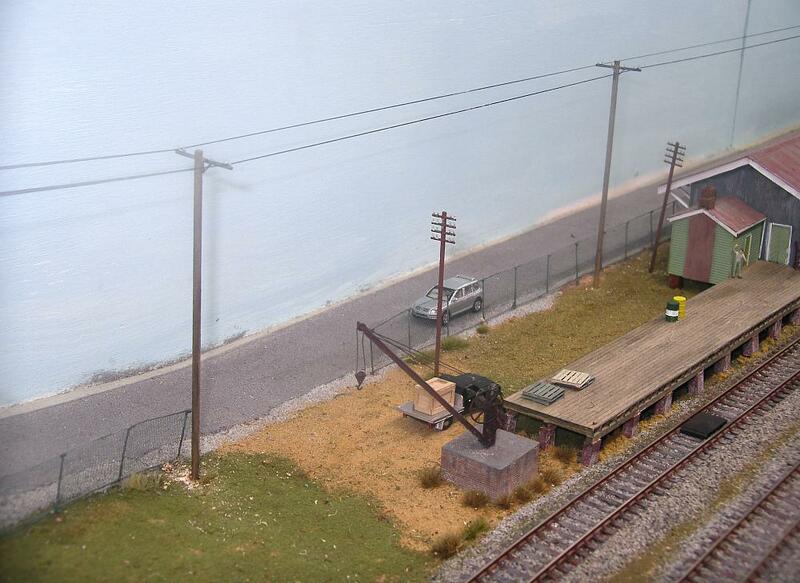 Firstly, we decided to add some height to the scenery by installing power poles and lines. The power poles were made from timber dowel, stained with inks and paint washes, and fitted with Atlas brand crossarms. The crossarms were also painted to represent the timber arm, metal bracing, and porcelain fittings. The shorter rail telegraph wires were made from Ratio brand poles, also painted to suit. The spacings between the poles were measured, holes drilled, and the poles were fixed in place with white glue. Once the glue had dried, stretchy Oingo Boingo brand and equivalent wires were then glued between the porcelain fittings on the croassarms. For where the modules join, a single crossarm was modified to clip onto an existing crossarm on the other side of a pole. The wires terminate on this crossarm, and the wires that have to traverse a module join are simply hooked and unhooked when setting up and packing away. Power poles and lines running along the main street behind the Goods Shed. The poles and wires are being added to each module as it is removed from the trailer, and when there is enough stock of crossarms and dowel to complete the whole layout. One of the photos taken during our visit to Wallerawang showed a wooden retaining wall located off to one side of the main line near the road bridge. Closer inspection and research revealed that it was not a wall but part of the original stock races. It was decided to model this remnant of Wallerawang's once larger yard. Styrene H-beams were painted a rust colour for the vertical rails used to hold the timber slabs in place. The timber slabs are made from Northeastern scribed timber, stained grey before installation. NR25 sits in the Down loop at Wallerawang. In the background can be seen the remainder of the stock race that once stood next to a siding in the yard. All that is left are the vertical rails and the horizontal timbers holding back the earth. Considerable vegetation has now taken over the site.